Kenai Fjords National Park was the second national park we visited on our Alaskan cruise trip. 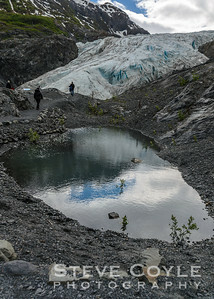 We spent one of the 2 days we had in Anchorage on a road trip to see this glacier at the park. 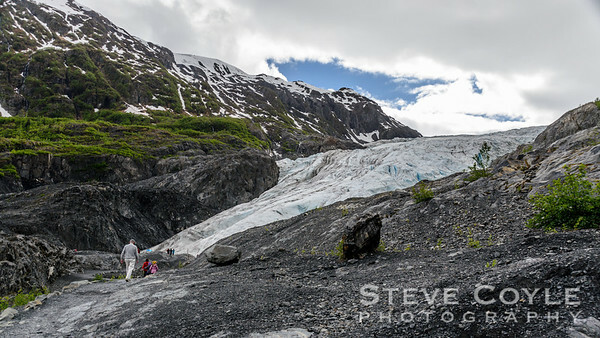 Exit Glacier is another glacier that is currently receding. If we had visited later in the summer we could have taken a ranger led hike to the glacier. As it was, we could hike to an overlook of the glacier as the people in this shot are doing. The hike to the overlook is about a mile each way and gets you really close to the glacier. You can't touch the glacier from the overlook, but it does get you really close. I'll post another shot from the lookout point later to give you an idea of how close to it you can get. One more glacier shot before we head to see more glaciers in Glacier National Park. 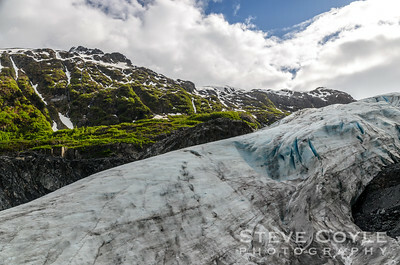 This is a shot of Exit Glacier in Kenai Fjords National Park in Alaska. This was as close as we got to a glacier on our Alaskan cruise trip. If we had been there later in the summer we could have taken a ranger led hike out onto the icefield that form the glacier, but we'll have to save that for another trip.